Yesterday, US District Judge Katherine Hayden dismissed the instant copyright infringement action filed by the American Board of Internal Medicine (ABIM) against defendent Jaime Salas Rushford MD because the action was time-barred by its three-year statute of limitations. On the same day that it filed the December 2009 complaint, ABIM successfully obtained an ex parte order from the district court authorizing United States Federal Marshal to "break open and/or forcibly enter" the individual defendents' homes and seize, among other things, all communications with ABR's customers relating to infringement of ABIM's copyrighted examination. This action later led to national headlines in June 2010 that claimed "doctors cheated." According to the ruling: "As a result of the seizure, ABIM obtained a trove of emails between Arora and various course attendees. 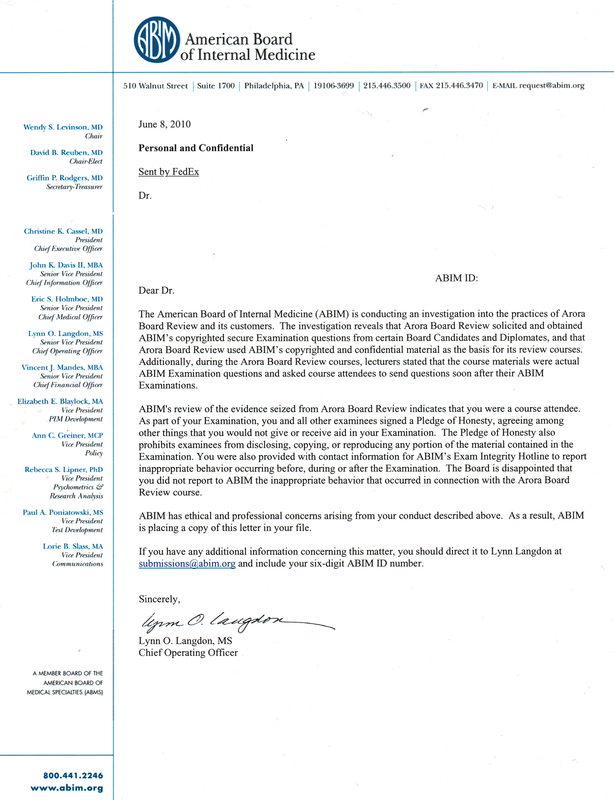 The lawsuit against Arora was settled in June, 2010, and according to counsel, ABIM began instituting action against individual physicians whom ABIM deemed complicit with Arora and ABR. 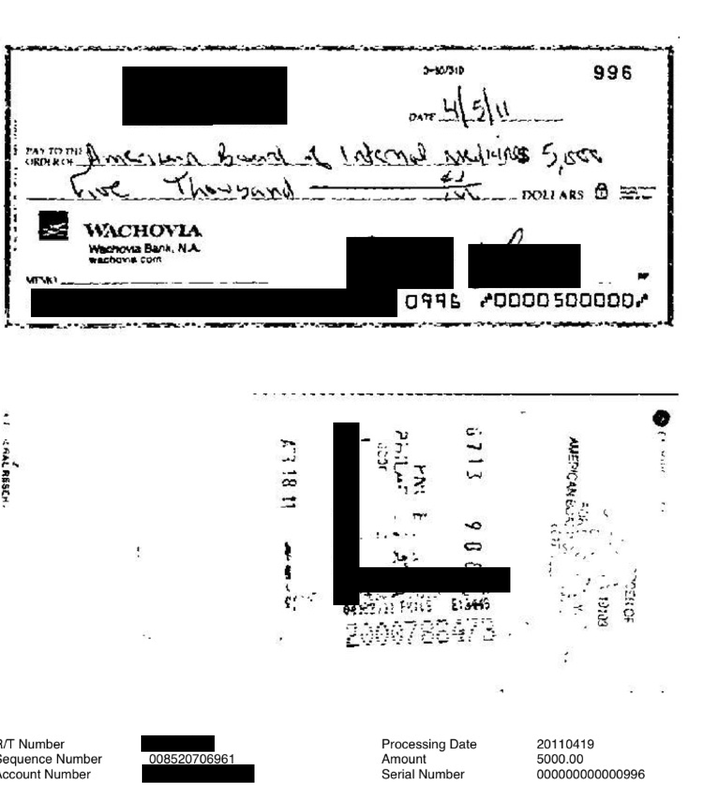 According to the complaint eventually filed in court, ABIM identified Jaime Salas Rushford in January 2012 as one of ABR's alledgedly complicit customers, when it linked him to an e-correspondence about August 2009 exam questions that was sent from the email address "padrinojr@yahoo.com." Salas allegedly began compiling detailed ABIM examination content that he got from colleagues who sat for the examination leading up to his own examination date 20 August 2009 and sent it to Arora using the padrinojr@yahoo.com email address." ABIM then waited until October 2014 to file the current action against him in October 2014, even though they knew the identity of Salas Rushford in January 2012, eight months before the three-year statute of limitations for their action against Arora ended. (ABIM argued that the three-year statute of limitations did not begin until January 2012 when the identified Salas Rushford as the owner of the padrinojr@yahoo.com email address.) In fact, the judge noted "ABIM made an intentional decision not to bring suit against Salas within the applicable limitations period when the alledged facts clearly show it was capable of doing so." Judge Hayden goes on to say that "this lawsuit against Salas is a coda to the main thrust of ABIM's litigation efforts, apparently born of a second look at the decision ABIM made not to sue Salas when his name popped up in January 2012." At the time Salas Rushford was sued by ABIM in 2014, he filed a counterclaim, not only against ABIM, but against Richard Baron, MD, Christine Cassel, MD, Lynn O. Langdon, Eric Holmbie, MD, and members of an alleged ABIM "Hearing Panel" comprised of David Coleman, MD, Joan M. Von Feldt, MD, and Naomi O'Grady, MD. He also included ABIM's insurance companies and Pearson Education Inc. in the counterclaim. That counterclaim now proceeds. The implications of the decision by the Judge Hayden yesterday are signficiant for a large portion of practicing US physicians and for the the financial solvency of the ABIM. According to its most recently-available Fiscal Year 2015 federal tax forms, the ABIM has a deficit of $50,642,980. Currently, their website lists the ABIM's FY 2016 expenses at $62.5 million, $2.5 million more than their federal tax form disclosed for fiscal year 2015. Legal expenses are signficiantly contributing to these expenses, not just "strategic non-capitalized spending on infrastructure upgrades in anticipation of the launch of a new MOC assessment in 2018" as ABIM claims on its website. How much higher can these expenses be allowed to go? Who shoulders these expenses? From 2000 to 2014, the cost of board certification has increased 244% (16.3%/year) from $795 to $1940 for general internists and 257% (17.2%/yr) from $995 to $2560 for specialists. This year, candidates sitting for their initial board certification in cardiac electrophysiology had to pay $2830 to register for their examination. If things continue the way they are, the countersuit by Salas Rushford will be the least of the ABIM's legal and financial concerns as doctors come together to act collectively on their own behalf. Disclaimer: I serve as an expert witness for Jaime Salas Rushford, MD and am a co-founder of Practicing Physicians of America, a physician advocacy organization. The pediatric Maintenance of Certification (MOC) propaganda machine rolls on - this week in the JAMA Pediatrics. Lewis R. First, MD, MS, David A Gremse, MD, and Joseph W. St. Geme, III, MD join forces to publish their opinion piece entitled "Maintenance of Certification - A Prescription for Improved Child Health" in JAMA Pediatrics on 27 Feb 2017. The only conflicts of interests they disclose to the public are their various associations with their institutions and various professional medical organizations with which they have been affiliated with over the years. As is typical for many of the JAMA publications published by the American Medical Association (AMA), they failed to disclose their ties to the pharmaceutical industry or the fact that annual Maintenance of Certification (MOC) revenues almost matches that of initial certification for the American Board of Pediatrics (ABP) every year. Lewis R. First, MD, MS advertises himself as restricting this practice to inpatients only on his University of Vermont website. Such a practice is hardly representative to the vast majority of pediatricians in the U.S. who primarily care for outpatients. It would not be surprising, then, that the hours required to participate in MOC would seem trivial to one who works in a sheltered inpatient workshop. He never mentions that he "won" the Joseph St. Geme Jr. Leadership award created in the honor of the father of his co-author, Joseph St. Geme III, MD, by the Academic Pediatric Association, American Academy of Pediatrics, American Pediatric Society, the Association of Medical School Pediatric Department Chairs (AMSPDC), the Association of Pediatric Program Chairs and the Society for Pediatric Research. To his credit, Dr. First does disclose the fact that the is chair of the AMSPDC Education Committee, member of the ABP Research Advisory Committee, member of the AMSPDC Planning Committee, editor of Pediatrics, and past chair of the National Board of Medical Examiners, so his enthusiasm for lifelong repeated testing of physicians is at least understandable as part of the vast network of Accreditation Council of Graduate Medical Education (ACGME) certification member organizations' fixation with lifelong testing and revenue generation. David A Gremse, MD disclosed that he is chair of the department of pediatrics at South Alabama University, chair-elect of the ABP, member of the AMSPDC Planning Committee, and past member of the AMSDPC Board of Directors. He failed to mention that he was secretary-treasurer of the ABP and a pediatric gastroenterologist. Finally Joseph W. St. Geme III, MD discloses he is chair of the department of pediatrics at the Children's Hospital of Philadelphia and the University of Pennsylvania, associate chair of the AMSPDC Research Committee, immediate past chair of the ABP (often with first class travel from the ABP) and Dr. St. Geme failed to mention his advisory role with PureTech Health, a "cross-disciplinary biopharmaceutical company." Why mention these conflicts? Because their article is filled with misinformation. First, board certification for pediatricians in America is no longer "voluntary"as these authors claim. It is disingenuous for them to claim board certification is "voluntary" when the next sentence they note "Hospitals increasingly require board certification for medical staff privileges credentialing bodies and payers often require board certification for participation in provider networks and for reimbursement." 'Third, improvements in outcome occurring over time could have taken place independent of changes in care delivery as part of the network. No external comparator group was available to help with this determination. However, not all centers showed improvement, and the improvement we observed took place over a relatively short period of time during which no new therapies were introduced into routine clinical practice. Finally, the processes we measured may not be directly responsible for the observed improvement in remission." In fiscal year 2015 (from the 2014 IRS Form 990) - the latest tax form the public can review - the American Board of Pediatrics earned $10,644,504 from the Maintenance of Certification program while their senior executives enjoyed first class airfare and paid spousal travel fees. They paid their former President and CEO who worked only 8 hours per week, James Stockman, III, MD, $793,991 - more money than their current highest paid employees, Executive Vice President of Credentialing and Exam Administration ($675,055) and President and CEO ($624.001). By comparison, one source cites the current median pediatrician salary in the US in 2017 as $187,376. Might these facts be more important to explain the authors' enthusiasm for promoting MOC than the flawed studies they cite regarding MOC's importance to patient care? These authors need to understand the days of pulling the wool over working physicians' eyes by publishing opinion pieces in journals sponsored by the AMA that has refused to end MOC despite recommendations made by their own House of Delegates are over. These continued efforts to justify MOC without acknowledging the programs many flaws and financial conflicts of interest must end. While physicians who chose to continue to work have little choice but to participate in MOC currently, efforts are underway across the nation to end MOC for all subspecialties on the basis of its discriminatory practice against younger physicians and because its adverse effects on physicians and their patients have never been studied (or even acknowledged) by these organizations that profit from the program without legitimate independent oversight. Remember Bob Wachter, MD, America's Most Influential Physician Executive in 2015? Remember how he played Elvis and sang "Your Hospitalist Song" at Mandalay Casino while serving on the board of IPC The Hospitalist Company in 2014? Remember how Dr Wachter pivoted to "love" as a quality measure in the New York Times after leaving the American Board of Internal Medicine (ABIM) and after he quietly earned $210,586 in income, stock, and options with IPC Hospitalist Company in 2014, a portion of which was shared with his institution? Remember how IPC Hospitalist was being investigated by the DOJ for Medicare fraud? Remember how IPC Hospitalist Company was acquired by TeamHealth for a hefty profit anyway? The DOJ's investigation completed and TeamHealth had a $60M judgement levied against it. I went to look what happened to TeamHealth's stock price at the time of that announcement, but was surprised to see that TeamHealth had disappeared from the New York Stock Exchange. It seems TeamHealth had been purchased by The Blackstone Group and became a private company just before the judgement was handed down. IPC Hospitalist Company. TeamHealth. All gone. All forgotten. 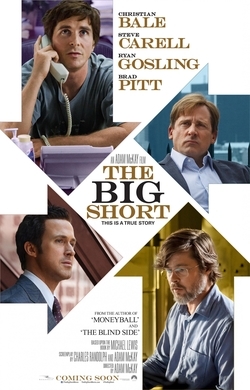 Welcome to US Medicine's mini-version of "The Big Short."